Mangroves are a group of unrelated plants, which have separately evolved the ability to live in the intertidal zone and the saltwater reaches of rivers and creeks. Australia’s mangroves come from twenty major plant families, mostly trees and shrubs, but also include one palm and one fern. Drag and zoom on the map below to explore the location of our mangrove habitats. The richest mangrove communities live in the tropics or subtropics, on sheltered coastlines with summer water temperatures over 24 degrees Celsius and high annual rainfall (over 1250mm). Life between the land and the sea isn't easy; it is a harsh and changeable environment, which can range from hot and dry to fully inundated with salt water in the space of one tidal cycle. The sediment is saturated with salty water, soft and unstable, and low in oxygen. 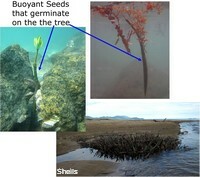 Mangroves have evolved some important adaptations to cope with these conditions. Mangroves have complex, shallow root systems that support them, and also have special openings on their roots and stems, called lenticels, which allow them to breathe above the mud. Mangroves deal with salt by selectively taking up water and keeping salt out, by pushing salt out through special glands on their leaves, or by packing the salt into old leaves and shedding them. 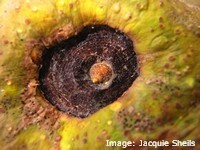 Many mangrove species have special seeds that germinate while they are still attached to the plant (vivipary). 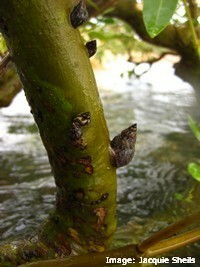 This allows the tree to release a ready-to-grow ‘propagule’ straight into the water. The propagule can float in a semi-dormant state until it reaches a spot where it can settle and grow. Mangrove propagules have buoyant floats and special shapes that make sure that they float, disperse and establish effectively. Mangrove growth is affected by the time and depth of flooding by saltwater, the sediment type, freshwater flows, evaporation rates, nutrient flows and exposure to wave action. 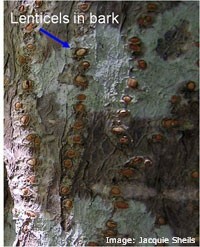 Each species has its own preferred conditions which affect where it will grow. There is 3800km2 of mangrove habitat in the Great Barrier Reef region, made up of 39 different species; this is nearly all of Australia’s 41 species and over half of the World’s 72 species. Mangrove, seagrass and salt-marsh habitats often occur together; they are closely inter-dependant and many species move between them at different stages of the tide. 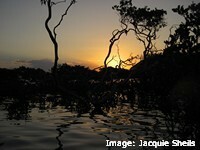 Mangroves are an important connection between the land and the sea. Many land insects, birds and animals use mangrove habitats for food and shelter. 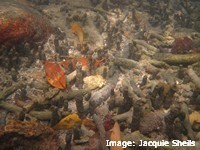 Mangrove habitats in the Great Barrier Reef region are home to about 60 crab species, which mostly feed on leaf litter and live in burrows in the sediment. These burrows are so extensive, reaching down as far as 1m, that they have major effects on the water flow through the sediment, allowing the tides to flush out salt and bring in the oxygen and nutrients that the plants need. Micro-organisms that live inside the crab burrows break down debris and leaf litter into nutrients that supply coastal food chains. These burrows also provide shelter for other invertebrates and small fish that are food for larger animals. Researchers have found that a teaspoon of mud from a mangrove forest in North Queensland can contain over 10 billion bacteria; this is equal with the highest recorded in marine mud anywhere. This may not sound appealing, but these bacteria play a vital role in recycling debris and wastes, providing the nutrients needed for plant and animal growth. Mangrove habitats feed and shelter many commercially important fish and crustacean species and supply the food chains that drive the productivity of our coastal waters. Mangroves filter the water running off the land, trapping sediment, debris and nutrients, improving coastal water quality. Mangrove trees and their root systems stabilise sediment and protect the coast from damage from storm waves and high winds. 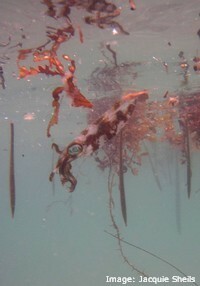 Mangroves, saltmarshes and seagrass meadows are among the densest known carbon sinks by area. They store between 2-10 times the amount of carbon held in tropical forests, and because it is buried in stable sediments, they hang on to it much longer than forests on land. The Whitsunday region is home to around 13 species of mangrove and has around 62 km2 of mangrove habitat, including seven different kinds of mangrove community. ‘Saltwater’ or estuarine crocodiles (Crocodylus porosus) live in mangrove habitat in the Proserpine River and its tributaries. They are considered to be vulnerable to extinction due to intensive harvesting in the mid 20th century. 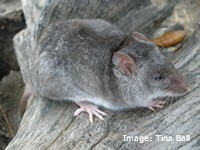 The vulnerable mangrove mouse (Xeromys myoides), once known as the false water rat, was first discovered in Mackay and is now considered to be endangered. Within the Mackay Whitsunday region, it only lives in habitats dominated by yellow and orange mangroves (Ceriops tagal and Bruguiera spp. 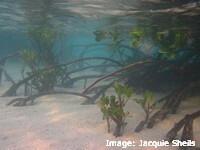 ), which are only about 25% of the mangrove area in the region. Green sea turtles (Chelonia mydas) feed on mangrove fruits at high tide. Dugongs(Dugong dugon) shelter in mangrove channels. 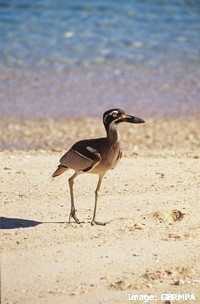 The vulnerable beach stone curlew, Esacus magnirostris, uses mangroves for foraging and shelter. 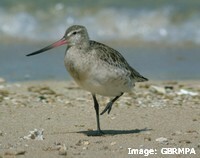 Mangroves provide vital protected roosting sites and food for many species of migratory and resident shorebirds. Between 1953 and 1995, about 6 per cent of mangroves in the Whitsunday region were cleared to make way for human activity. 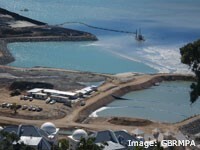 Since then, continuing land reclamation in Queensland for residential housing, resorts, marinas and industrial ports has added to the permanent loss of mangrove habitats. Coastal development and changed land use changes water flows, salinity, sediment and nutrient flows, and tidal flushing in mangrove habitats downstream. Increased sediment in coastal waters has increased the area of mangrove habitat in the region over the last 40 years, but too much sediment from soil erosion can bury the breathing roots (pneumatophores) of mangroves, causing stress and even dieback. 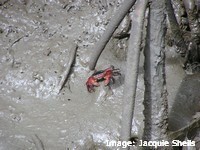 Changed water flows into mangroves due to urban development and drainage can cause declines in mangrove crab populations. This can have serious flow-on effects because crabs are 'keystone species' in mangrove systems; they break down leaf litter, supplying nutrients to the rest of the mangrove food chain. High loads of nutrients from fertilisers, sewage outfalls and urban run-off can cause algal blooms that can smother mangrove pneumatophores, causing dieback. 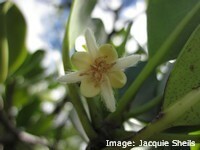 Herbicides and chemicals in run-off can have toxic effects on mangrove plants. 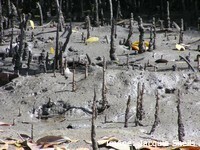 Mangroves are also particularly sensitive to oil because it can block their pneumatophores and also have toxic effects. Disturbance of acid Sulfate Soils produces runoff that is highly acidic (pH<4) and is harmful to mangroves. 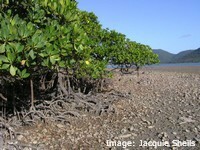 Weeds are a threat to mangrove habitats, especially rubber vine (Cryptostegia grandiflora) which can grow in the same salty conditions. 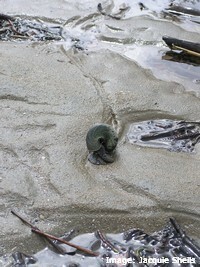 Pest animals such as feral pigs also damage mangrove habitat. Because of their position between the land and the sea, mangroves are on the frontline of climate change, facing threats such as sea level rise, increased freshwater flows and damage from extreme weather events. With their ability to colonise new areas and rapidly recover from disturbance, mangroves also have the potential to adapt to these changes. Support local programs to monitor and protect mangrove habitat, such as Mangrove Watch. Avoid littering the marine environment: pick up litter when you visit the coast, even if it isn’t yours! Water quality begins at home (and at work...)! Remember that the chemicals you use will ultimately end up in the sea. Use environmentally friendly chemicals; avoid artificial herbicides and pesticides if you can. If you have to use harmful chemicals, follow the instructions on the label carefully and avoid uses that might let chemicals wash into drains or waterways. Don’t leave garden waste on the foreshore: weeds can invade mangroves. Choose your garden plants carefully: avoid species that can invade natural habitats. Support local weed control programs.